In the first part of my series on Wi-Fi hacking, we discussed the basic terms and technologies associated with Wi-Fi. Now that you have a firm grip on what Wi-Fi is exactly and how it works, we can start diving into more advance topics on how to hack Wi-Fi. In this article, we'll take a look at the world's best Wi-Fi hacking software, aircrack-ng, which we previously used to bump your annoying neighbor off their own Wi-Fi network. We'll be using aircrack-ng in nearly all of the subsequent hacks, so I think it's wise to start with some basics on what is included and how to use everything. 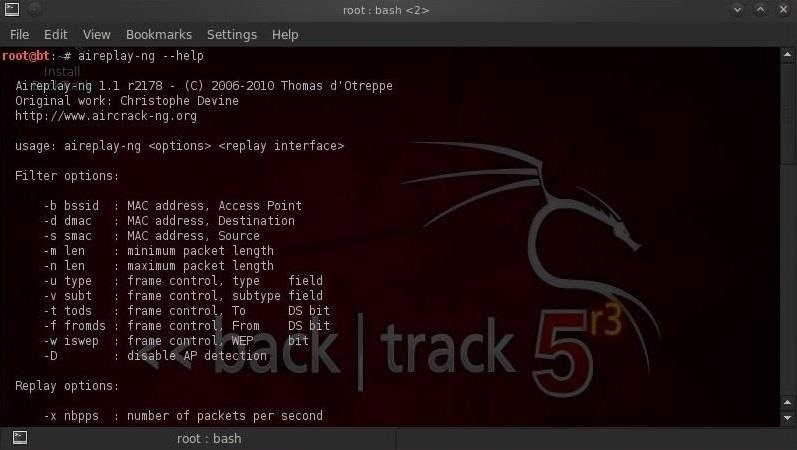 First of all, aircrack-ng is not a single tool, but rather a suite of tools for manipulating and cracking Wi-Fi networks. Within this suite, there is a tool called aircrack for cracking passwords, but to get to the cracking we need to do several steps using other tools. In addition, aircrack-ng is capable of doing DOS attacks as well rogue access points, caffe latte, evil twin, and many others. So, let's get started with the aircrack-ng suite! The ng stands for new generation, as aircrack-ng replaces an older suite called aircrack that is no longer supported. We can see here that BackTrack recognizes my USB wireless card, and it tells me that it's capable of 802.11bgn, that the ESSID is off, that the mode is managed, etc. Okay, now we're ready to start using aircrack-ng. The first tool we will look at and need in nearly ever WiFi hack is airmon-ng, which converts our wireless card into a promiscuous mode wireless card. Yes, that means that our wireless card will hookup with anyone! Well, that's almost correct. When our network card is in promiscuous mode, it means that it can see and receive all network traffic. Generally, network cards will only receive packets intended for them (as determined by the MAC address of the NIC), but with airmon-ng, it will receive all wireless traffic intended for us or not. Airmon-ng responds with some key information on our wireless adapter including the chipset and driver. Most importantly, note that it has changed the designation for our wireless adapter from wlan1 to mon0. The next tool in the aircrack-ng suite that we will need is airodump-ng, which enables us to capture packets of our specification. It's particularly useful in password cracking. 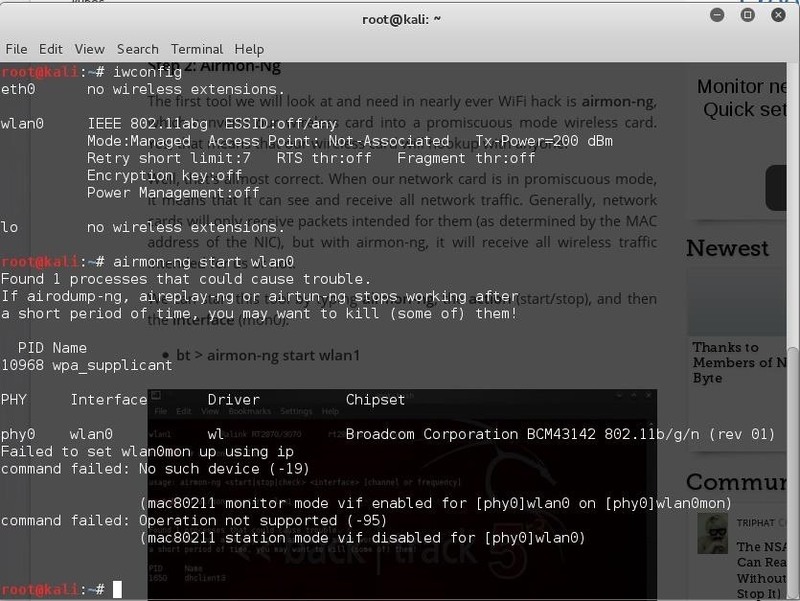 As we can see in the screenshot above, airodump-ng displays all of the APs (access points) within range with their BSSID (MAC address), their power, the number of beacon frames, the number of data packets, the channel, the speed, the encryption method, the type of cipher used, the authentication method used, and finally, the ESSID. For our purposes of hacking WiFi, the most important fields will be the BSSID and the channel. Aireplay-ng is another powerful tool in our aircrack-ng arsenal, and it can be used to generate or accelerate traffic on the AP. 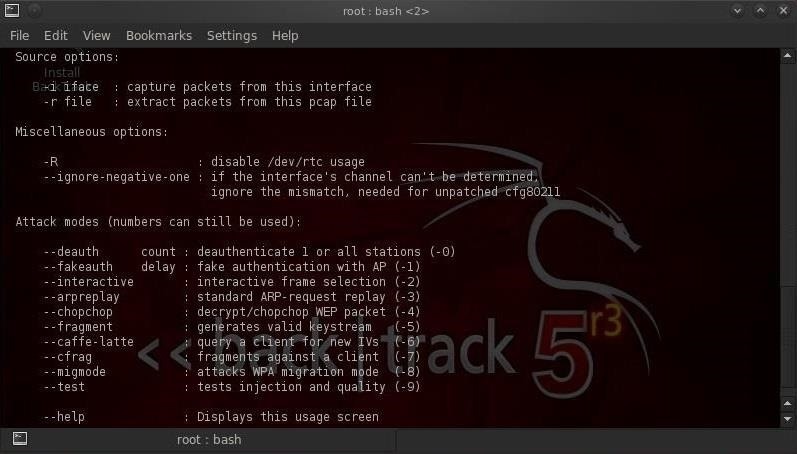 This can be especially useful in attacks like a deauth attack that bumps everyone off the access point, WEP and WPA2 password attacks, as well as ARP injection and replay attacks. The pcap file is the standard file type associated with packet capture tools like libpcap and winpcap. If you've ever used Wireshark, you've most likely worked with pcap files. These include deauth, fake deauth, interactive, arpreplay (necessary for fast WEP cracking), chopchop (a form of statistical technique for WEP packet decrypting without cracking the password), fragment, caffe latte (attacking the client side), and others. These four tools in the aircrack-ng suite are our Wi-Fi hacking work horses. We'll use each of these in nearly every Wi-Fi hack. Some of our more hack-specific tools include airdecap-ng, airtun-ng, airolib-ng and airbase-ng. Let's take a brief look at each of these. Airdecap-ng enables us to decrypt wireless traffic once we have cracked the key. In other words, once we have the key on the wireless access point, not only can we use the bandwidth on the access point, but with airdecap-ng we can decrypt everyone's traffic on the AP and watch everything they're doing (the key is used for both access and for encryption). Airtun-ng is a virtual tunnel interface creator. We can use airtun-ng to set up an IDS on the wireless traffic to detect malicious or other traffic on the wireless access point. So, if we're looking to get an alert of a particular type of traffic (see my tutorial on creating a PRISM-like spy tool), we can use airtun-ng to set up a virtual tunnel that connects to an IDS like Snort to send us alerts. Airolib-ng stores or manages ESSID's (the name of the access point) and password lists that will help speed up WPA/WPA2 password cracking. 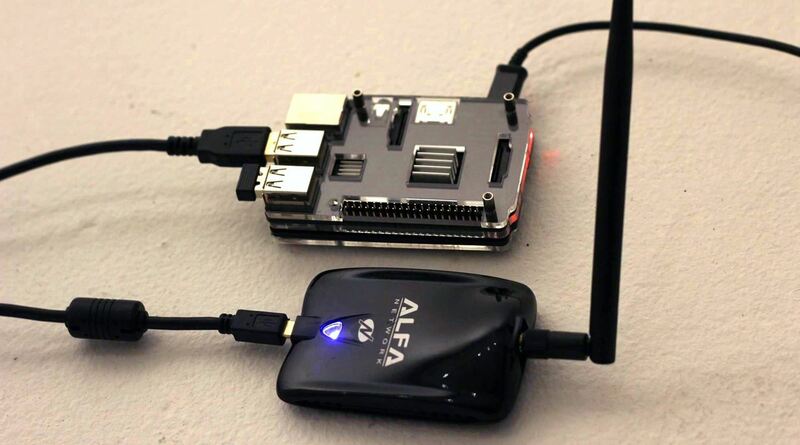 Airbase-ng enables us to turn our laptop and wireless card into an AP. This can be especially useful when doing a rogue access point or evil twin attacks. Basically, airbase-ng allows us to attack the clients, rather than the AP, and encourages the clients to associate with us rather than the real AP. These are the primary tools in the aircrack-ng suite that we'll be using as we explore Wi-F hacking. There are other tools, but these are the ones we'll be focusing on. 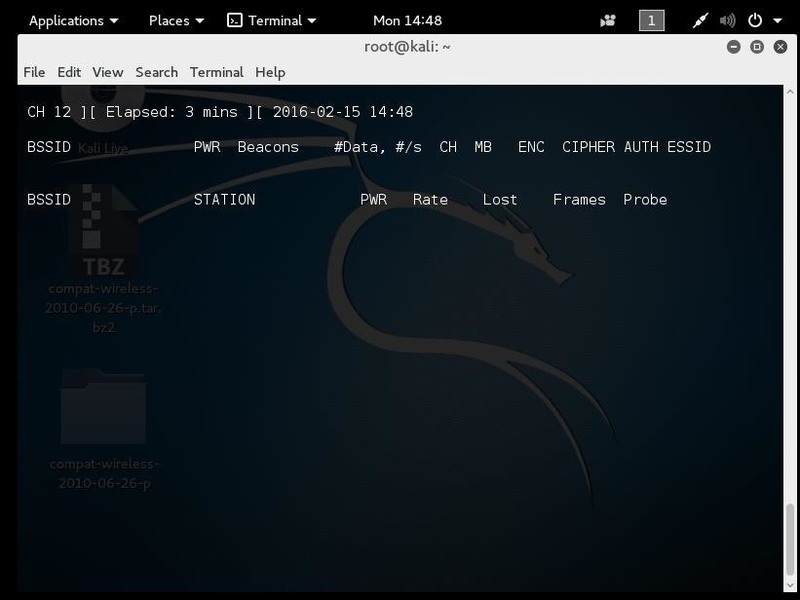 If you're looking for a cheap, handy platform to get started working with aircrack, check out our Kali Linux Raspberry Pi build using the $35 Raspberry Pi. 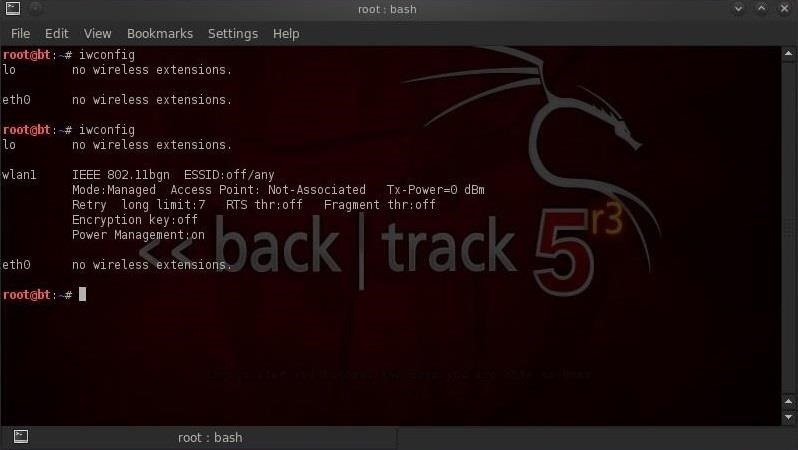 In our next guide, we'll start our exploration of wireless hacking techniques with creating a evil twin access point, so make sure to keep coming back. If you have any questions, please comment below or start a discussion in the Null Byte forum and we'll try to help you out. Now i'm a lamer and i'd like to know something new and maybe better then only wifi hacking in the future. Before my wireless card wasn't recognized by backtrack so i bought the adapter u told about and it works fine. when i type airmon-ng nothing show to me :/ whats wrong can u tell me pls ? or gimme your email and i send you message ..
Did you check to see whether your wireless card is up and running? Also, the command requires the start command with the name of the interface. When you type iwconfig, what is your wireless adapter? i am on wlan0 instead of wlan1 but when i use the command (airodump-ng start mon0) i keep getting "airodump-ng --help" for help. i cannot proceed further than here because of this ...help plz ! First, you must put wlan0 in monitor mode. Are you using an aircrack-ng compatible wireless adapter? I know I am talking very naive but this is the first time I am doing anything like this.. This software is all on BackTrack. Its a Linux distribution with hacking and security tools. You can get it directly from here. I have several tutorials on Null Byte on how to install and use it. You will be seeing me more often now. There Efe origin afflicting thou shalt not work for me why? This opens a table but there are no where WIFI. iwconfig should list your wifi interfaces. 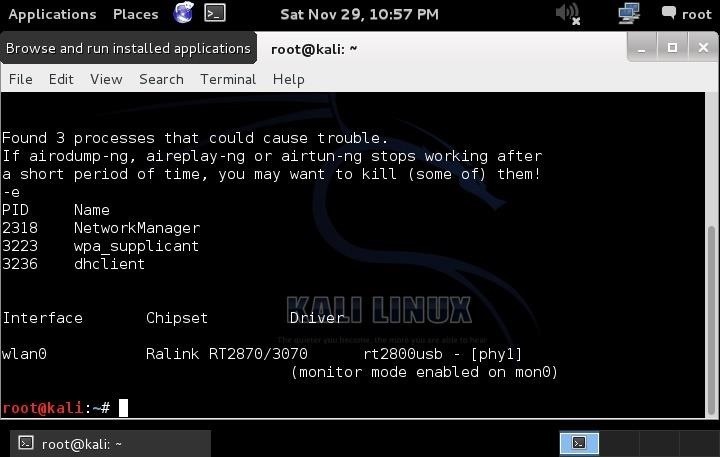 Then you need to put your wifi adapter into monitor mode with airmon-ng. 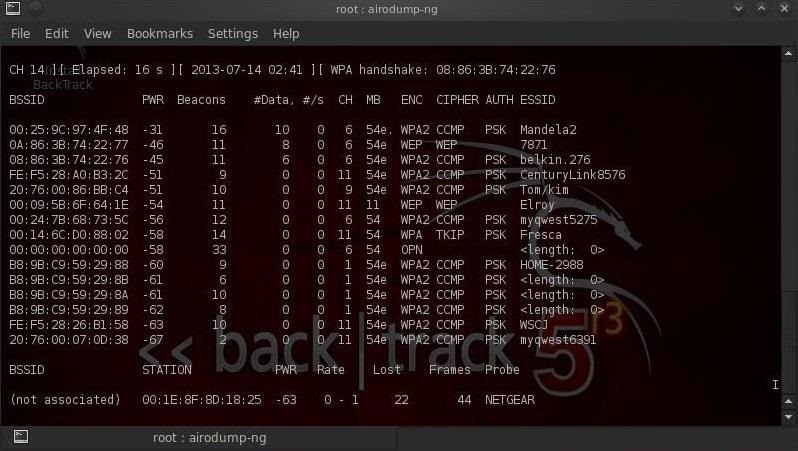 After putting it into monitor mode, you then use airodump-ng to see all the AP's. What happens when you type iwconfig? When running BackTrack in a VM, you must have an external wireless adapter such as a USB wireless adapter. Otherwise, you will need to run BackTrack directly on the hardware to use your built in wifi. Can I Dual Boot Kali Linux And Windows 8.1 To hack wifi password, I am using a laptop core i 3 ??? 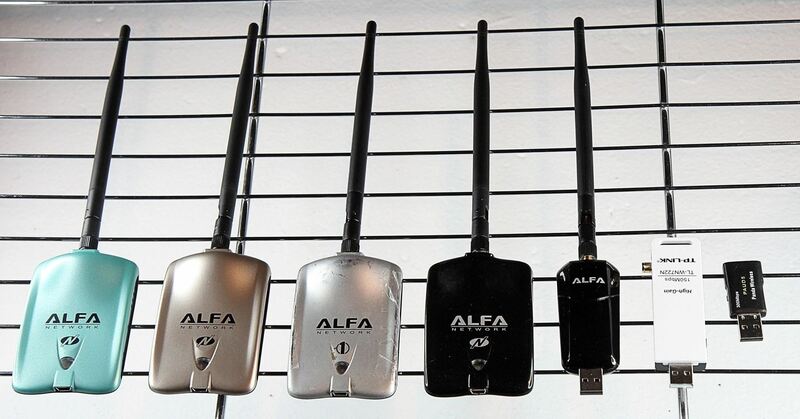 I suggest buying an ALFA card for hacking wifi. You will need one to do all my hacks. You can also install BT as a dual boot system. I have a wireless card D-Link How do I get ALFA card?? How do I install BT? The Alfa card is available from nearly all the electronic retailers. I have a tutorial here on how to install Backtrack. Download BackTrack, burn it to a disk and then install on your hard drive. 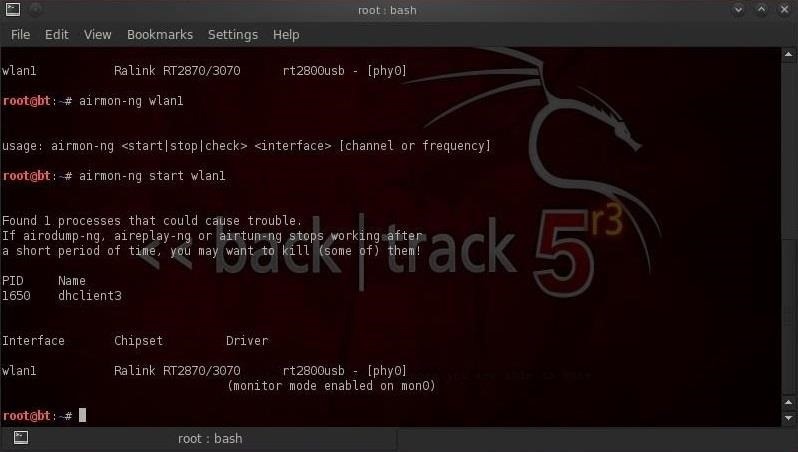 BackTrack will prompt you to make a dual boot system. Disc DVD + R that good? It can burn the Maya Attribute infest? Are running in a vm? Yes, took me a little while to get the adapter up and running, so I may have configured something wrong. It looks exactly like the screenshot from the lesson. Only difference is my tx-power=20 dB. Woooow, detached USB, plugged it back in... Problem solved. I should know better than that. Thanks for the quick response and help OTW. Can you please add me on facebook, so you can give me some quick response, my name is sebastian nielsen with the squirrel picture to the left. Ps. Im your biggest fan!!! Welcome to Null Byte! I'm glad you are enjoying my tutorials. As you can imagine, I need to maintain my anonymity so I can only communicate with you through Null Byte. Sorry. what I thought was that you could make a fake facebook account. where you could get a lot of friends who have questions about your "block" that you could give quick response to. and of course you need to write fake things down about yourself. So you can stay anonymous. Why becouse i dont like to try the tutorial out and wait for you answer my quistions after some hours. I hope you understand and might have changed my mind. I don't see how a Facebook page would get you a faster response. The limiting factor is me. For this tutorial would it be wise for me to disconnect myself from the internet before attempting it? Hey Gumskull, not sure what OTW will say, but I've been successful using a cable LAN connection for my internet connection and then using the aircracking suite on wireless that way you can still read the tutorials, look up things etc. I agree with Existing Me. My problem here is that my router is downstairs and my computer is upstairs and I don't have an ethernet cable long enough to reach upstairs without demolishing the house. Would it still work if I were to use a wireless connection? You make an excellent point there. My mind doesn't work the easy way around. Thank you. So...we have all so painfully learned. Try aireplay-ng --help, but mostly i think it's because your using "channel -1" instead of "channel 1"
Nice Article, but i am just curious to know that is it really necessary to switch wlan into mon mode ? I couldn't observe any certain difference in the console terminals. Both the processes seemed same to me. If you don't put the wlan into mon mode, you will be limited in what packets you can pick up and send. Wow... Perfect and simply guide! Check out this post on how to fix this issue. At the end of your code use "--ignore-negative-one"
You need all these tools and they are all built into Kali. It must be aircrack compatible. So my wireless adapter (ALFA AWUS036NH) arrived and on the command:iwconfig,it detects my wireless adapter.Then I typed airmon-ng start wlan0 and was assigned to monitor mode mon0,but when I typed in airodump-ng mon0,I do not receive any clients on the network.Any ideas OTW? For your next set of questions maybe: https://www.google.com/search?q=AWUS036NH+linux+issues "
Attach some screenshots so we can see what's going on and diagnose the issue. 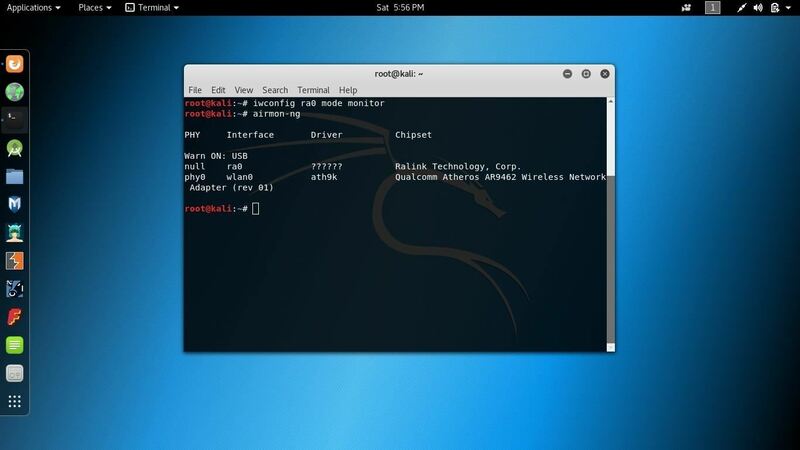 I'm using Kali 2.0 in a Virtual machine. I've followed your tutorials. It's really great. But now I'm facing some problems. So, what's the problem here??? why I'm not getting any "BSSID", "CH" here??? Here's the problem,no wireless clients returned. And what are those 17 steps you're talking about? what's the name of the very first terminal you open ? One question: when i execute airdump, what does the part under the Aap list represent? The one with STATION column? Thank you. That represents the MAC address of the client. Which client? I see about 3-4 macs there and I'm not connected to any network. Clients of which network? The BSSID is the AP and the station is the client. I have a problem OTW. 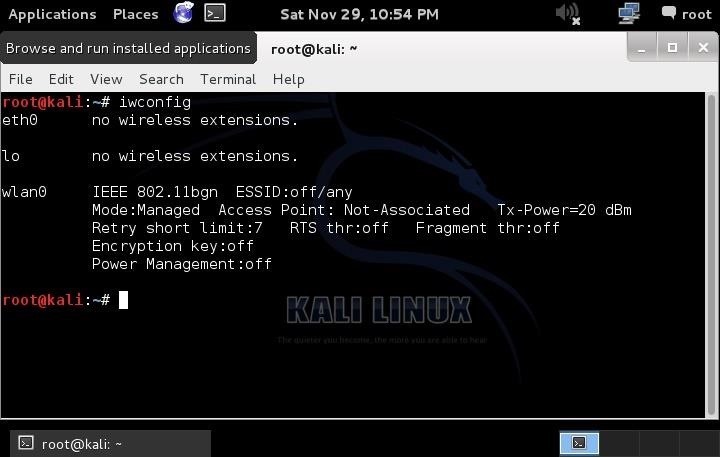 First of all I'm using kali Linux 2.0 on virtual box and the second I don't have a wireless card but I downloaded compat wirless 2010-09-01-p so I when I use a iwconfig I can see that there is a wireless card named wlan0. After entering airmong-ng start wlan0 my wireless adapter won't change to monitor mode (mon0)..also i get a lot more output, for example encryption key, ESSID, access point etc.. I tried some other commands, but nothing worked. I'm running the Realtek Semiconductor Corp. RTL8191SU 802.11n chipset. After some research I guess this chipset isn't compatible to aricrack-ng?? Please help me out.. i just want to be sure before buying a new adapter. Did you happen to read the week old comment right above yours? Hello, I've been trying to get this to work, but it's not. 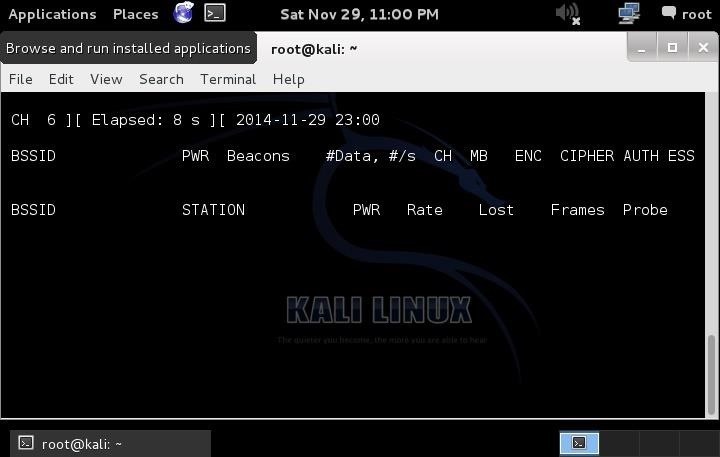 I'm running Kali Linux 2.0 on a live persistent USB. Below is a screenshot of when I type iwconfig and airmon-ng start wlan0. I have tried airmon-ng check kill btw. Note that in the error message it references wlan0mon. The new version of aircarck-ng using that designation for the monitor interface. Try running airmon-ng start wlan0mon. I've now tried that, and it doesn't show any errors with the airmon-ng start wlan0mon. But when I try airodump-ng mon0, or anything other than airodump-ng wlan0, it says that device is not found. "But when I try airodump-ng mon0 or anything other than airodump-ng wlan0, it says that device is not found." It is getting complicated when it shouldn't. Have you ever packet injected or put that card into monitor mode? This would help some if you could take the interfaces down and up and set modes manually. I am going to sleep if they have not helped you I will look at this again in few hours. I have never packet injected or put this card into monitor mode. This is my first time ever trying aircrack-ng. As for taking the interfaces down and up and setting them manually, I'm not sure what you mean. I've never heard about that before. But just take your time, or tell me if this is getting too annoying to help with. When the machine comes back up try again w/o killing all the processes. Then let us know if that helped. This card is compatible with aircrack-ng and packet injection yes? Sadly that did not help. I don't know if it's compatible with aircrack-ng and packet injection. Where do I check that? Sorry, I have only been working with Linux for a few weeks, so I'm still a newbie. A dictionary attack? ROFL. Is it really worth it to hack into grammies router with the password "cookies"? HAHAHAHA!!! Pls help to fix this ?? Does it say that causes or may cause? Its different. You can use it without kill any process, but if you encounter any try to kill them.